Note: As we did not have early access to the multiplayer component of the game, this review relates to the single player campaign of Uncharted 4: A Thief’s End. Multiplayer impressions will come at a later time. 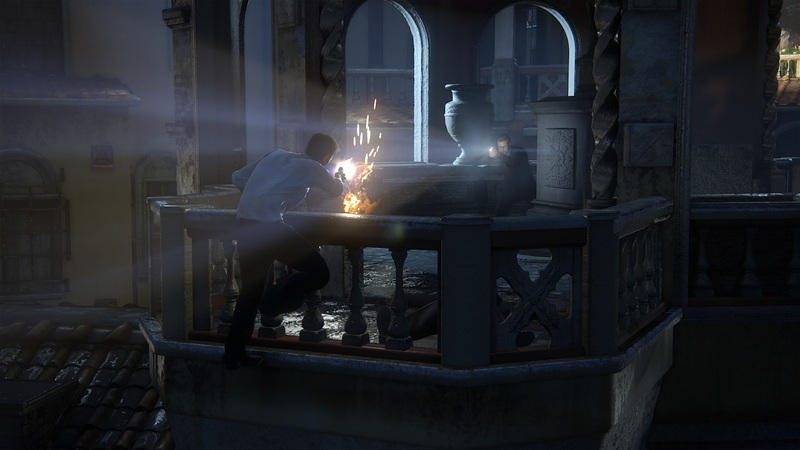 Right off the bat, I’m going to say Uncharted 4: A Thief’s End is a marvel to behold. 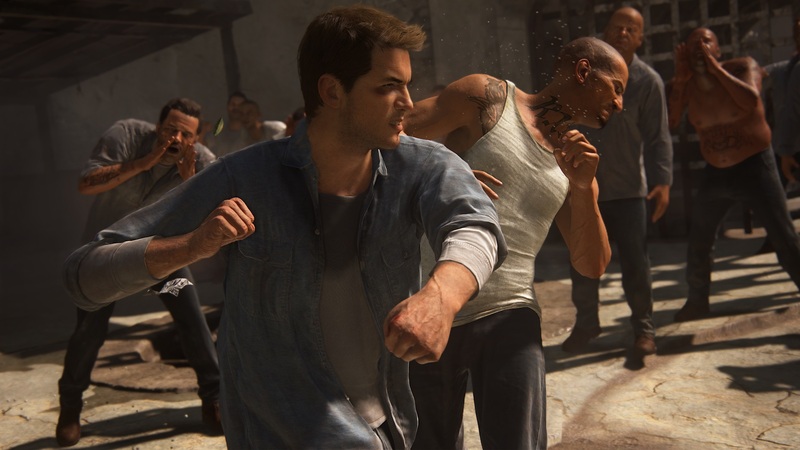 While it is not without its issues, and certainly not the best of the franchise, Uncharted 4 delivers as both a technological powerhouse and as a compelling piece of interactive fiction. My eyes were dazzled, adrenaline was pumped and many cheeky half smiles were had across the game’s surprisingly lengthy 14 hour campaign, resulting in a fitting end to the swashbuckling tales of Nathan Drake. So you can all relax: the game is good. You can stop realistically sweating Nate. Nate’s attempt to lead a normal, non-ancient ruins plundering life is disrupted by the return of his thought-to-be-dead older brother Sam (who he’s conveniently never mentioned before). Sam is determined to continue the brothers’ search for legendary pirate Henry Avery’s treasure, as the gold would let him pay off a debt in order to save his life. While Nate is hesitant given he and Elena, now his wife, swore they were done with all the guns and danger, loyalty to his brother and his lustful longing for adventure eventually sway him to dive headlong back into the treasure hunting game. 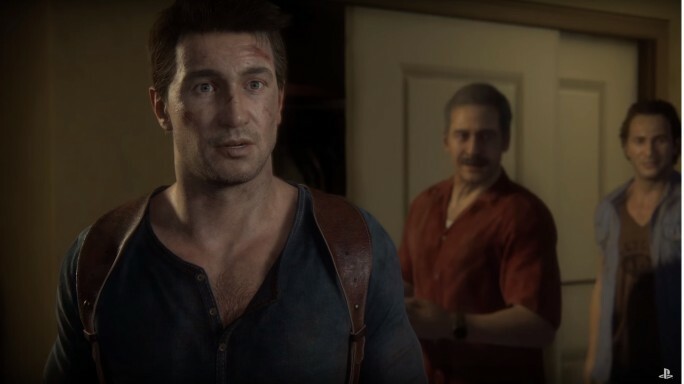 Uncharted 4 feels very different to the three games preceding it, most likely due to the fact it is directed by The Last of Us’ Bruce Straley and Neil Druckmann rather than the original series’ director Amy Henning. The core story itself is essentially the “one last job” cliche, mimicking Hollywood popcorn adventure movies just like the other games of the series, but there are some clear Last of Us touches in how the narrative is presented. There is a stronger focus on characterisation through smaller intimate moments over ridiculous action sequences, particularly in the opening few hours. The introduction may be a major point of contention for some players as a result of this. 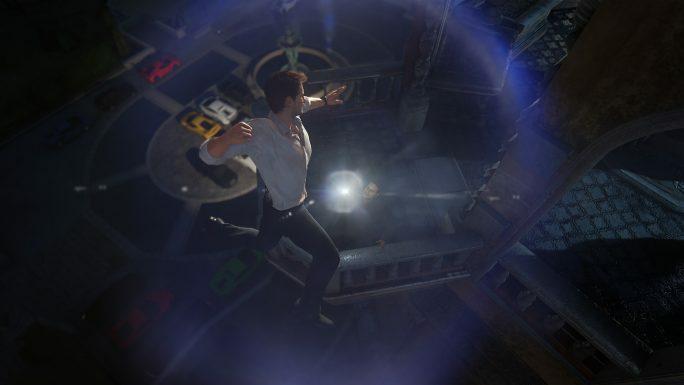 For me, well, it was no train dangling off a cliff from Uncharted 2, but the effort taken to establish not just the context of the story but exactly what Nate is risking by throwing his lot in with his brother really paid off in the latter parts of the game. It’s just a shame that the latter parts tend to drag thanks to a big case of “sorry, the princess is in another castle” syndrome. Don’t get me wrong, the story is great and has some fantastic twists and turns, but the way the third act’s structure is so heavily reliant on constantly moving the goalposts further and further away became tiresome. And the ending itself (no spoilers) was maybe a little bit sappy and went on a bit too long for my tastes, but the intent was clearly to give a definitive ending to this series and in that regard I’d say they did a satisfying job. I’m not ashamed to admit these two are incredibly adorable together. But what we’re all really here for is the action, and though it takes a while to get going, I assure you it is epic when it gets there. Admittedly there are fewer jaw dropping set pieces than in previous games, but the visual quality and complexities afforded by the PlayStation 4 certainly made them all the more spectacular. A personal favourite was the Madagascar mud chase shown at E3, which was ridiculous to play despite having seen it already. The way Naughty Dog weaves cinematic, cutscene-like camera work into these player controlled sequences is just masterful. And speaking of Uncharted 4’s visual quality: holy balls is this game unbelievably gorgeous. The level of detail thrown into the characters, environments and effects is astounding; from the pores in people’s skin, the subtley in their expressions, to the cluttered city streets, stunning ruins and gobsmacking landscapes. And that this graphical beauty all performs so well is just the icing on the cake. Uncharted 4 may run at 30 frames-per-second but it is a goddamn rock solid 30, only dropping maybe twice in some intense crowd scenes, which I’ll take over a variable 60 frames any day. The only real graphical issue present is the game goes a little overboard with motion blur effects. I know it’s there to make the lower frame rate appear smoother, but it resulted in some really murky eyesores if the camera was spun around too fast. Most of the time it was fine, but when your game looks this good it really stands out when it doesn’t. Naughty Dog have also once again shown how recording the voice acting in tandem with facial and motion capture is the best way to create believable characters. The entire cast give exemplary performances throughout the game’s cutscenes and in the many, many side quips during playable sections. The two villains did admittedly feel a little under developed, but even still this is video game acting at it some of its finest. Gameplay wise, the gun-play has remained relatively unchanged, featuring a decent array of firearms to select from the corpses of enemies. Fans either love or hate Uncharted’s less accurate shooting mechanics, but I personally find they work well in the context of Nate not being a soldier, just a guy who knows his way around a gun. Enemies are also fairly clever, or at least clever enough, as they constantly change up their cover as Nate moves around the area, using grenades to flush him out etc. Moving around, thinking on your feet and a little luck are key to conquering Uncharted 4’s shootouts. Not all the gameplay is the same though; there are some noticeable changes to the usual Uncharted formula. For one, there is often more than one route to travel through the game, a nice surprise that offered a little more control over to the player in this linear story. Nate still has the ability to climb insanely precarious things with his absurdly high levels of upper body strength, although now he has a few new gadgets and tweaks up his sleeve to help him traverse some of the crazier obstacles. The most notable is the grappling hook, allowing Nate to swing across huge chasms, climb up/rappel down walls and pull things out of hard to reach places. It comes in handy in some action scenes as well, when a quick escape from being pinned down by gunfire can be an awesome Tarzan swing across the room and landing on the floor via punching some hired goon in the face. 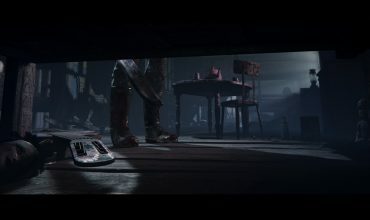 Some alterations have been made to improve the mechanics for the stealth sections of the game but they still lack some important attributes. On top of the usual quiet take-downs and cover based techniques, Naughty Dog have added areas of tall grass/other foliage to hide in that really free the player up to move around and find the optimal position to strike upon unsuspecting foes. Tall grass also doubles as a means to hide the bodies of guards so as to not arouse suspicion, however this only works if the guard is killed within the tall grass itself as the bodies cannot be moved out of sight. A similar issue is present with regards to the ability to mark enemies so they can be tracked on the screen. A useful addition, but in order to mark anyone you need to hold down the aim button, which will prompt Nate to pop out of cover, and then click the left analogue stick. In open areas this was less of a problem, but in Uncharted 4‘s more close quarters sections it would often result in me being spotted. Pretty much all of my stealth encounters against more than three enemies ended in me having to go loud and shoot everyone due to one or both of these issues. Nate’s never been one for the subtle approach. Thankfully though there are very few stealth sections that are compulsory, meaning going loud is a viable option and doesn’t break Uncharted 4’s flow with repetitive retries. In fact, many of the combat encounters are designed to allow the player to tackle them however they want, something the series hasn’t really done before. This is particularly evident about halfway through the game in the epic Madagascar sequence, part of which was shown off last month, where Nate, Sam and Sully are driving around a huge area in a four-wheel-drive. The Uncharted series has had controlled vehicle sections before, but never in a such an open environment and with as much freedom of movement as this section did. Approaching enemy locations meant you could just ride in and shoot up the place, or sneak around and tactically take them out. I often found myself coming up with strategies like securing a guard tower and surprising opponents by sniping from above, or picking off the perimeter first so I could just lob a grenade into the centre clump. This particular chapter felt like a miniature Metal Gear Solid V at times, and was a nice change of pace. The Uncharted series has been a staple of single player, narrative focused, linear gaming for the nine years since it was first unveiled. Despite its flaws, Uncharted 4 succeeds as a fitting send off to Nathan Drake and the epic adventures we’ve had with him. It might not be the best game in the series but if you own a PS4, whether you’re a long time fan or new to the franchise, it is certainly a game you shouldn’t miss. Naughty Dog's finale to the Uncharted franchise makes for a fitting end for the swashbuckling adventures of Nathan Drake. Its story unnecessarily drags in its final act, but the overall narrative, grandiose presentation, epic action gameplay and witty characters still deliver one hell of a gaming experience. Have an adventure with Tom on Twitter @tomdheath and don’t forget to follow @load_screen and like us on Facebook. Final Fantasy XV review: More than just a sausage party?